Cyber Connect Social Networking site for all bloggers and businesses worldwide has been launched today. Cyber Connect is bringing together all bloggers and businesses worldwide in one spot. Generate more audience and traffic with the help of Cyber Connect social network in your businesses and blogs. Join now and take advantage of what they got to offer from blogging tips to monetization. Cyber Connect Social Network is giving away an amazing product.. They want you to kick start your new year in a grand style with DELL STREAK 7 4G/Wi-Fi ANDROID TABLET OR $270 Cash via Paypal. Just for one lucky person and it could be you! 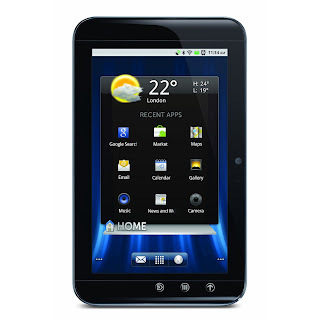 The Android-based Dell Streak 7 is the ultimate entertainment hub for those craving a rich multimedia and web experience. It features a brilliant 7-inch WVGA multi-touch display made of damage-resistant Gorilla Glass that's ideal for Web browsing, streaming video, watching TV and movies, reading books and magazines, or playing games wherever you roam. And so many other amazing features. N/B: This giveaway will end on the 21 January 2012. The draw will be made by Cyber Connect team not me. And they are responsible for the shipment of this item if you win.. Goodluck and Happy new year..
Hiya I am now Following you back from Linkies Contest Linkies. Don't forget to list your giveaways anytime with us. Thanks for stopping by. I am following on gfc, G+ and Networked blogs. Off I go to your other blogs. Apple’s Android competitors outshine the iPhone in the camera resolution and screen size department. Claw Digital Review says , Apple’s retina display is smaller than many slab Android phones but often approaches or beats them in resolution. If Apple goes with a larger screen, 8-megapixel camera and full 1080p video recording, it’ll need more horsepower to support all of them. The bigger screen, in particular, will also demand more battery power. Apple’s been very careful about battery life (it’s why it fought so long and hard against multi-tasking) and it may have to increase battery size and capacity to support a larger retina screen.